Costolette d’Angello. Photo by Giulia Doyle. Of course, it has been known forever that herbs will invigorate any dish. The volatile compounds are what count. Dill — well, we can’t help thinking of pickles. Holy basil, with its scent of cloves, elevates pad Thai to another plane. And where would we be without wormwood? Up the creek without our necessary glass of absinthe, right? Robust, spiky-leaved rosemary is pungent with minty pine. So what better match for the herb than lamb? Italian restaurant Giovanni’s offers a rosemary rack — the best in the city, I’ll wager. “If you treat it right, [the meat] shines through,” says chef Filip Szardurski. 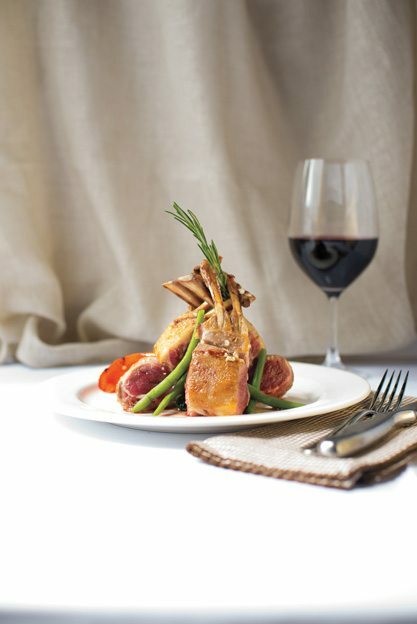 Rosemary, garlic, house-made demi-glace, and olive oil give this seven-rib rack of lamb superb flavour. So tender, so juicy! The sparkle comes from lemon. No fancy-dancey here, just classic cuisine at its best. “A dying art,” Szardurski opines. Best hurry down to Preston Street, am I right? $44.95. Giovanni’s Ristorante, 362 Preston St., 613-234-3156. For years now, the Japanese have been flavouring sponge rolls, ice cream — marshmallows, even! — with their ceremonial green tea. Well, why not caramels? Robin Coull, owner of online confectionery Morsel, says she “completely fell in love with matcha” while living in Japan. Coull’s matcha black sesame caramels are made through the slow cooking of cream and sugar. Bite into one — not too hard and not too soft. Butterscotch flavour is followed by the nuttiness of black sesame seeds and the grassy herbal qualities of the matcha. All flavours then roll into one. Sweet. $6.95/pkg. Morsel, 613-601-6764. Frank Pay, owner and chef at Harmony, calls these gems pancakes — they remind us all too well of calzones. Jiucai hezi (chive pockets) are popular in Pay’s hometown of Dezhou in northern China. “Some put meat in them, but we like chives,” Pay declares. These turnovers are pan-fried to a golden brown until the dough is as crisp and light as pastry — with a bit of tug and chew. The garlicky bright green Chinese chive filling, with traces of scrambled egg throughout, is piping hot. Feel free to down anytime. Two/$4.95. Harmony Restaurant, 769 Gladstone Ave., 613-234-9379.